“This is how dumb I am,” Ryan Looney is saying. It was the spring of 2015, and Looney was head basketball coach at Seattle Pacific University when a high school player and his father knocked on his office door. They were looking for a scholarship. Looney politely listened to their pitch: A promising junior season was wiped out by a torn ACL, then his senior season, too, when he tore it again. The last time he had played was a sophomore, when he was 6-foot point guard. But he had grown, and he loved the game, and he had great potential, and he’d work really hard. Looney had most of his roster returning from a team that went 24-8 and was ranked as high as No. 2 in Division II. He had no more available scholarships, and the kid’s family would have to pay SPU’s $50,000 tuition as a walk-on. He thanked them for stopping by and wished them luck. It is the spring of 2018, and Looney has since become coach at Div. II Point Loma Nazarene. An email pops into his inbox. It’s from Daulton Hommes, the kid who sat in his office three years earlier and inquired about a scholarship despite last playing as a 6-0 sophomore point guard and twice blowing out the same knee. He had walked on at Western Washington, and now he wanted to transfer. He was interested in Point Loma Nazarene. “I was smart enough the second time around to say yes,” Looney says. “I talked to him three times on the phone that day. Forty-eight hours later, we booked a flight for him to come visit. He went home, and a few days later he committed. He also laughs about what else Hommes told him on the phone that day: I think I can play in the NBA. Looney is speaking after practice a few weeks ago. A respected scout from an Eastern Conference team was there to watch. Plugged the campus address into his phone, wound through Point Loma’s residential areas, turned right at Lomaland Drive, drove up the hill past the guard shack and down the other side to the athletic facilities. Took in the sweeping vistas of the Pacific Ocean, then ducked inside a 56-year-old gymnasium with a curved roof to see an even more jaw-dropping sight. Did he have a couple hours to kill while in town watching San Diego State’s Jalen McDaniels? Nope. Made a special trip to see the hidden gem of a player on the hidden gem of a campus. Hommes is 6-8 now, hitting a growth spurt while sitting out three straight years — the last two in high school and as a redshirt at Western Washington. He’s athletic. He’s got a quick first step. He finishes strong. He can handle the ball. He can shoot it (oh, can he shoot). He can pass. He can defend. Looney never saw Hommes in high school, and Point Loma Nazarene didn’t play Western Washington in his two seasons there. But he heard things, heard about the growing legend of the kid from the small Washington town tucked under the Canadian border. In August, Hommes latched onto a team looking for someone to fill out its roster at Zeke-End, an annual pro-am tournament in Tacoma hosted by Washington alum Isaiah Thomas. Several NBA players were on the floor that weekend: Kyle Kuzma, Zach LaVine, Jamal Crawford, Marquese Chriss, Dejounte Murray. Hommes had 36 points and 12 rebounds in his first game against several of them. Agents were texting Looney at halftime. “You know, I definitely wish my injuries didn’t happen,” Hommes says quietly, “but I believe that everything happens for a reason. My story is just going to be a little different. I definitely I have a little bit of a chip on my shoulder. I mean, I was a walk-on at Div. II. I would say I’m a confident individual, but I’m humble enough to know I have to work for everything. Everything is earned, not given. And I’ve just kind of had the underdog mentality to work harder than everyone else. Here’s how it is supposed to go: You get noticed on the AAU circuit during the summer before your junior year in high school, draw interest from college coaches, receive scholarship offers, take official campus visits, then sign a letter of intent in November of your senior year. He made the Lynden Christian varsity as a freshman and came off the bench on a team that won the Washington state title. The following year, he started and averaged 9.5 points. “A couple of starters graduated, and for all intents and purposes Daulton was going to be our main guy going into his junior season. He was 6-1, creeping up on 6-2, but you could tell he was just a baby deer. He came from an athletic family, and you could just tell he was going to grow. I got a call from an assistant coach at Washington who told me they thought he had a chance to be pretty good and they were going to start recruiting him. “Literally two days later we were playing a summer league game, and we thought Daulton had a chance to go for 50 (points). He was already over 30 in the third quarter. I know the exact spot on the floor where it happened, the exact spot. I can see it in my mind. It was a loose ball. Daulton bent over to pick it up, and as he bent over a kid dove for it and took out his knee. Except Hommes initially thought it was a mere sprain. He also was Lynden Christian’s starting quarterback, and preseason football practice began a few weeks later. He lasted two weeks before it gave out. He needed reconstructive surgery. His basketball season was over before it started. Hommes dutifully attended every practice and every game anyway, intent on building leadership skills ahead of his senior year. He was cleared in the summer. First day back, no contact, a simple crossover dribbling drill … did it again. Same knee. Same injury. Same surgery. Same attitude. He showed up at every practice and game again. When no one offered him a scholarship, he walked on at Western Washington, a public Div. II school in nearby Bellingham with in-state tuition of $8,600. He sat out his first year to completely heal the knee and adjust to his new body, which was now pushing 6-7. His first time in uniform was an exhibition at Washington. His first collegiate basket was a two-handed dunk on a Huskies freshman named Markelle Fultz, who the following summer would be the No. 1 pick in the 2017 NBA Draft. His first official game was against Sonoma State: 29 points on 11-of-13 shooting. He would average 12.5 points that season and lead the Great Northwest Athletic Conference in 3-point shooting at 47.9 percent. As a sophomore, he averaged 18.1 and had a high of 37. But the team was falling apart, and a teammate transferred to Div. I Grand Canyon. Hommes wanted to leave as well, but because he already used his redshirt year he would burn a season of eligibility sitting out as a Div. I transfer and have only one left. Div. II has no such transfer restrictions. Hommes didn’t look long. 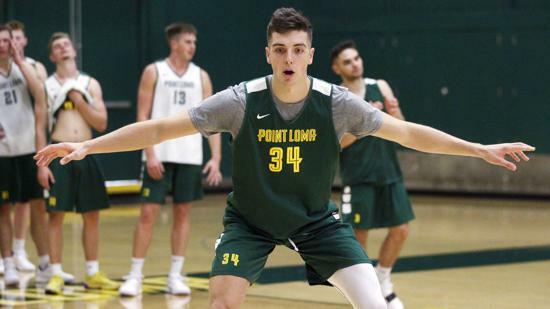 Former Lynden Christian teammate Sterling Somers was at Point Loma Nazarene, and they’d kept in touch.